PendidikanBekam.com - Complaints excruciating joint pain and muscle due to rheumatic diseases is very disturbing. But do not just rely on pain medication to get rid of the complaint. Soaking in salt water could actually help. In contrast to conventional drugs that are sometimes side effects, soak in salt water has no side effects. 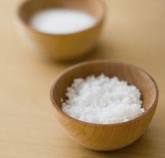 Salt water is known to reduce the effects of inflammation on the joints so that the pain is reduced. Conclusions are presented by researchers from the University of Manchester, UK. They discover how the expansion of the body's cells to control inflammation, the immune system response to injury or infection. In experiments with mice in the laboratory, it is known that mice injected brine in the area of ​​inflammation, swelling reduced after water from the cells inflate it sucked again. Vincent Compan, researchers from the University of Manchester said in the body cells of arthritis patients undergo development, but salt water can reduce it by way of drying. Salt water works the same way, whether it is injected into the body or absorbed through the skin after bathing or dipping bandages patients into salt water. This could explain why patients with rheumatoid a soak in the hot mountain experience reduced pain symptoms. "We found a hypotonic fluid or low salt content, just activate inflammation on the molecular level," said Dr.Pablo Pelegrin, one of the researchers. He added that the use of osmoterapi (dehydration) with hypertonic fluids or high salt can help in governance inflammatory diseases of the joints, such as rheumatoid arthritis. Moreover, until now there is no medicine that can cure rheumatoid arthritis are autoimmune diseases included in it.